Written by Australian Interpersonal Skills Specialist, Mark Coburn, this 4 part eBook series is jam packed with literally hundreds of powerful tips, topics and techniques that will boost your interpersonal communication skills and change the way you relate to your clients and customers. "These tools have equipped me to facilitate building relationships with new clients. I feel more confident with face to face interaction and I have a better understanding of my own communication style." 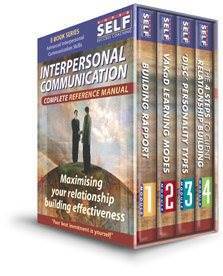 The Interpersonal Communication Complete Reference is a 4 Part eBook series that reveals the techniques and strategies around building rapport, understanding your client’s body language, learning styles and personality types. You also have access to a powerful 4 step relationship building process that is designed improve your customer relationship effectiveness and increase your prospect to client conversion rate. nderstanding the 4 different learning modes and styles of your client, visual(V), auditory(A), kinesthetic(K) and auditory digital(aD). nderstanding the 4 different personality types of your client, dominant(D), inspiring(I), steady(S) and conscientious(C). "I have gained new skills on how to understand people and how to approach and interact with clients." So there you have it… order it. Explore hundreds of tips and ideas. Test the concepts. Implement the strategies. Anytime over the next 30 days if you are not totally satisfied that the information in this eBook is worth much more than the price you paid, just contact us to receive a 100% refund ! You have an entire 30 days – risk free – to decide. "I now better understand the needs of different clients. I have learnt how to relate and communicate more effectively with clients who I am not used to dealing with." Discover the importance of the body language your clients use and what gestures you can put into practice to communicate more effectively. You will also learn how to become a master communicator by using your voice in a pleasant way that gets great results for everyone. As you tap into the uncommon knowledge of people’s senses and learning styles you will uncover many of the secrets of how to present more effectively to a visual, auditory, kinesthetic or auditory digital person in business. Find out how practical these quick reference cards are and how they provide more understanding to BONUS #1 eBook “101 Interpersonal Communication Tips”. You will receive them in business card size (shown smaller above). You can print them, laminate them and carry them around with you or keep them on your desk as a useful prompt when speaking to your customers on the phone. "I have gained real insights into the type of personality a person is and how to direct the most appropriate questions to that personality."